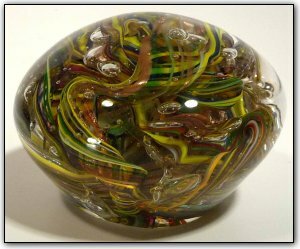 This paperweight is from the End Of Day series, meaning it is made with a variety of colors used throughout the day, and contains nearly every color in the rainbow. It is huge and weighs over 3.5 pounds! It has lots of bubbles and is covered with a nice layer of very smooth glass. This one-of-a-kind paperweight also has real gold adventurine added for that extra gold sparkle. The more light you shine on this piece... the more it will sparkle!